The foyer, with the unmistakable play of this classical tile pattern – could anything be more French? A classical French villa comes to life in small-town Karnataka, nestled deep within the bylanes of Byadgi, a small town in Karnataka, stood an old ancestral home, dilapidated and broken yet seeking love. The Betgeri House as it has always been known, sought a new identity. And so the story begins. 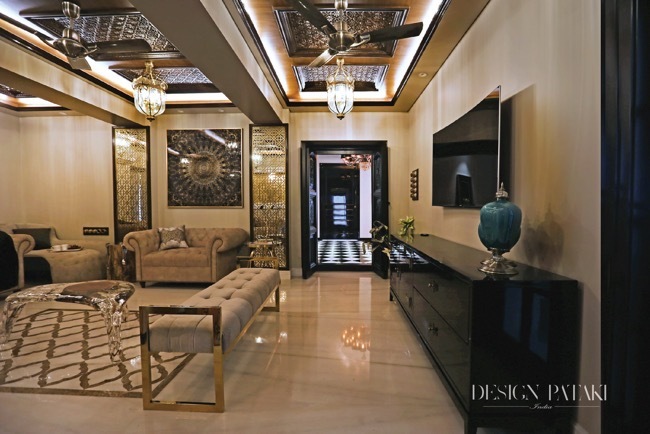 Conceptualised, planned and executed by Elysium Abodes, the old home was converted into a seven-bedroom classical French villa complete with a home theatre, jacuzzi, spa and recreation center to name a few of its amenities. Completed in only 13 months, the project stands to be one of the most radical transformations that blend the client’s vision of yesterday and tomorrow, today. A bold and dominant entrance graces you, a testament to the design style seen through the house. The living room, resplendence hidden in the tiniest of details. 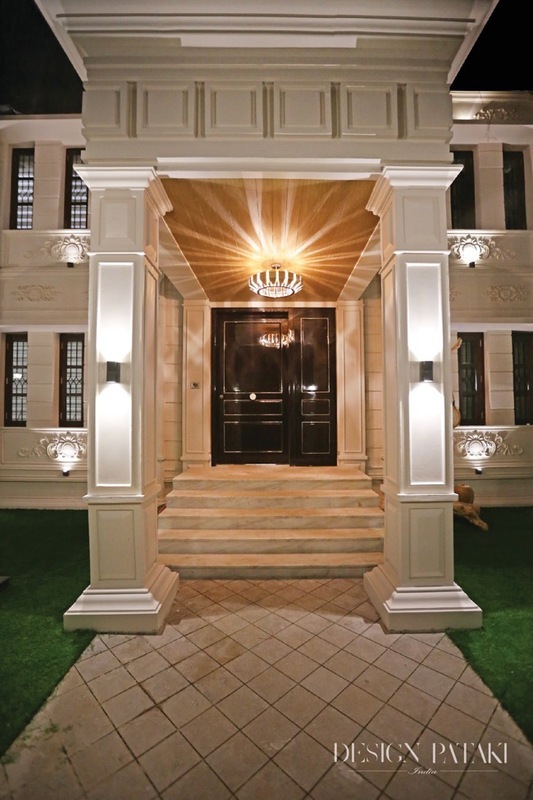 The external facade of the house, covered in Glassfibre Reinforced Concrete, with intricate designs that are a testament to the royal lifestyle inherent within the Betgeri family. The entrance itself is bold and dominant. 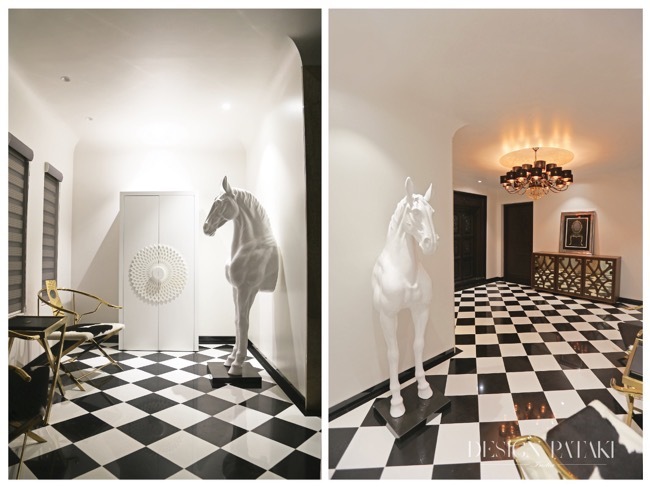 A classic black and white chessboard floor, referencing the Royal Museums of France, makes for a dramatic entrance. An oversized chandelier lights up the entryway with sophisticated style. Looking closely, one sees refurbished old wooden rafters and carved doors that invoke the sensibilities of the French classical style. Throughout the house, specially treated stones, tiles, Italian marble, wood and brass have been used to balance opulence with elegance and design. The Living Room has been decorated with mirrored pillars with brass inlay work, as well as air chiffon curtains with a silken draped sheer curtain. The ceiling has been clad with intricately carved wooden panels sourced from an auction house and have been meticulously restored as per the requirements of the room. A staple design element converted to suit both function and form. No classical French home is complete without a stairway. The Betgeri House boasts of a stairway that elegantly merges form with function. For a more dramatic ambience, the Empire chandelier, an inspiration from the Empire State Building, has been installed. At the end of the staircase is ‘The Arch’, leading you to the den and the dedicated home theatre room. The guest bedroom is designed to be a luxe chamber that beckons sleep towards any who may come through those doors. 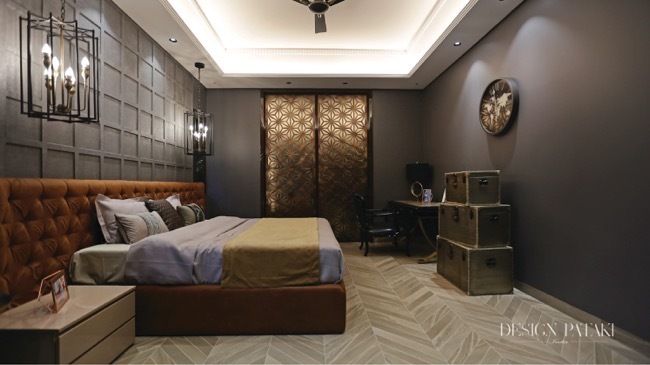 The deep texture of the charcoal walls is offset by the rust coloured headboard of a classical French-styled bed. The grey of the walls compliments the trio of trunks that have come to epitomise this style of design. Function and form have both been accounted for in a classical wooden desk nestled In a work corner. The Italian marble flooring is tied into the grander scheme of the room with help from the subtle hue of the side tables, and the plush linen of the bed. The lights invoke a long lost nostalgia and are a perfect balance between the cold metal and warmth of the palette chosen for this room. Today, the house that has stood the test of time tells an entirely different story. Reflecting the family’s love for certain stylistic elements, colour choices and design tonality, the house boasts of a remarkable transformation suited to the family’s needs today. The Betgeri house is bold, classic and a perfect marriage between what was, what is, and what is to be. 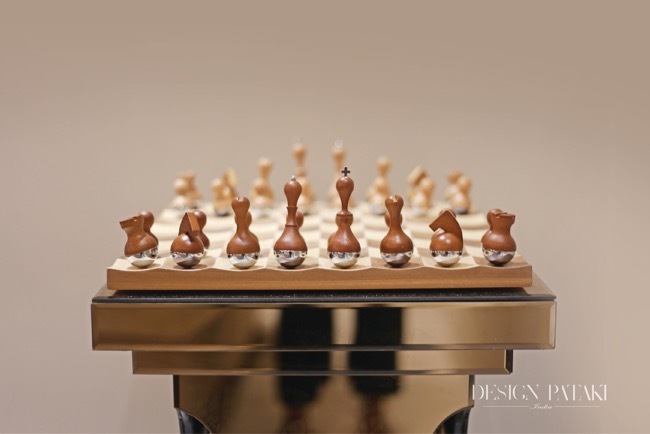 A classically carved chessboard, complete with a gold finish to resonate that Striking French aesthetic.